I am thrilled to say that I am publishing a new book, and this time, it’s a physical book that you can hold in your hands and flip through. Ever since David and I published The Journal Junkies Workshop and Journal Fodder 365 with North Light Books, we’ve been wanting to publish a book of just journal pages. Unfortunately we’ve been turned down by North Light, as well as several other publishers, but I’ve been mulling over the idea of self publishing a book for quite a while now. Well, it’s almost a reality. I know that I’ve posted on various social media outlets over the past couple of months and written a couple of blogposts, but I wanted to drop an official announcement and release an image of the cover. 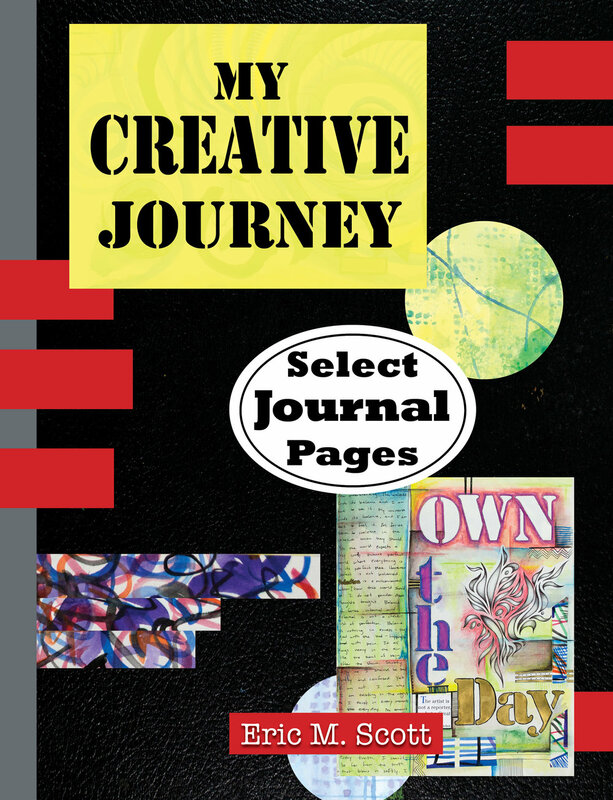 So, with any luck My Creative Journey: Select Journal Pages, will hit Amazon.com some time within the next two weeks. I’ve worked for the past two months to photograph and edit pages from the first 10 volumes of journals (I have over 24), and I put together nearly 70 two-page spreads in chronological order in this new book. I ramped up my work this past week and finished photographing, designing, writing, editing, and creating the cover, and last night I uploaded the completed manuscript to Kindle Direct Publishing (Amazon is phasing out their CreateSpace platform). I’m just waiting for a proof copy of the book, and hopefully, it will be ready for publication very soon. Despite the name of Amazon’s new self-publishing platform, an author can publish Kindle and/or print versions. This is a book of just my journal pages, and hopefully, we can get a volume of David’s pages published in the near future as well. But in the meantime, I wanted this new book to fit in with our other books, so it’ll be the same size - 8.5”x11” with 144 pages. I even designed the cover to be similar to our other books, but inside you’ll find a series of 2-page spreads, no techniques, no writing prompts, just pure journal goodness. I’ll post once the book is available. Newer PostMy Creative Journey is now available!